NOT ALL MAINTENANCE AND REPAIRS ARE CREATED EQUAL! For example, a "tune up" may mean different things to different technicians. 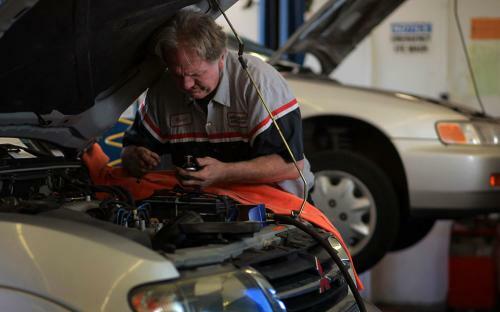 Prices will vary depending on whether the tune up is a Basic, Major, or Performance type. Each requires different parts and labor to complete. Ask us for a quote on what you need. As you probably know, cars manufactured after 1981 have engine computers that control various operations of your vehicle and generally make them run more efficiently. That is, if the computer is working. When its not, we have the tools and the training to diagnose and fix what is wrong. Preventive Services: oil changes, brake inspections, tune ups, filter changes, fluid level checks (brakes, power steering, transmission, windshield cleaners, etc), coolant and anti freeze levels, battery fluids, tire pressures, belt condition. We can provide the same mileage maintenance services as your dealer and many of their repairs without voiding your warranty. Necessary Repairs: Brake pad replacement, fuel system adjustments, timing belts and chain replacement, heating and cooling systems repairs, electrical system repairs, even complete engine rebuilds if necessary. Warranty: Happy Dane's is a certified Bumper to Bumper service center. We are backed by our "CONFIDENCE PLUS" North American Warranty. This is a 24 month or 24,000 mile limited parts and labor warranty that follows you nation wide. If an issue arises, the warranty work can be done at any of 20,000 preferred service shops in North America.